The terms affiliate, associate, and subsidiary refer to the degree of ownership that a parent company holds in another company. In most cases, affiliate and associate are used synonymously to describe a company whose parent only possesses a minority stake in the ownership of the company. However, a subsidiary is a company whose parent is a majority shareholder (owning more than 50%). While in a wholly owned subsidiary, the parent company owns 100% of the subsidiary. A parent company publish financial statement of its subsidiaries but not of associate. Associates are mentioned as asset on parent company financial statement. 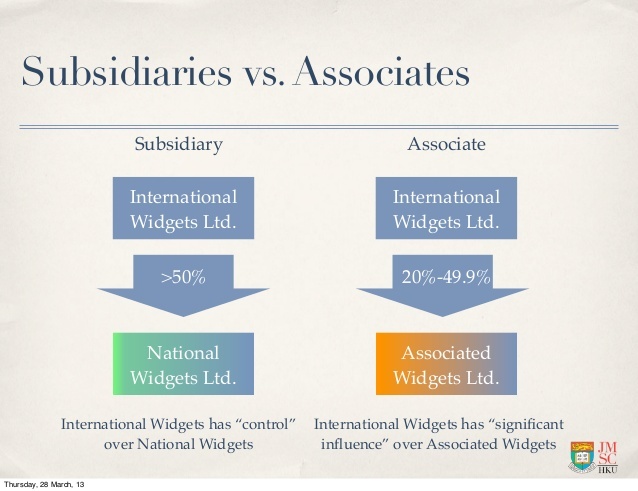 Read more: What are the differences between affiliate, associate and subsidiary companies?